My husband and I have been travelling in Italy for the last few weeks. We went to Avellino, Italy to see the birthplace of my husband’s great grandfather. While we were there, we had a delicious lunch at Patri Salumeria near the Duomo. The special of the day was eggplant parmigiana. I knew with the first bite that this dish was not made the way we make it in the USA. With the help of Google translate, I learned from Annalise, the owner, how to make this amazing dish. To begin, prepare the tomato sauce. In a medium sized dutch oven, pour extra virgin olive oil over the bottom of the pan. Pour in the tomato sauce. Use sauce that is the puree of san marzano or plum tomatoes. Add the sliced garlic and the basil. Let the sauce simmer for 30 minutes. Taste the sauce and adjust the sweetness with some sugar if necessary. Set aside. The eggplants in Italy are sweeter and have thinner skin than those back home. So for US readers, the first thing you need to do is peel the eggplants. Use the smallest eggplants you can find. Next break the eggs into a bowl and lightly whip them with a whisk. Place the flour onto a piece of parchment paper. Slice the eggplant lengthwise into 1/8″ slices. Dip each slice into the beaten egg and then into the flour. Lightly brown the slices in a frying pan using extra virgin olive oil. 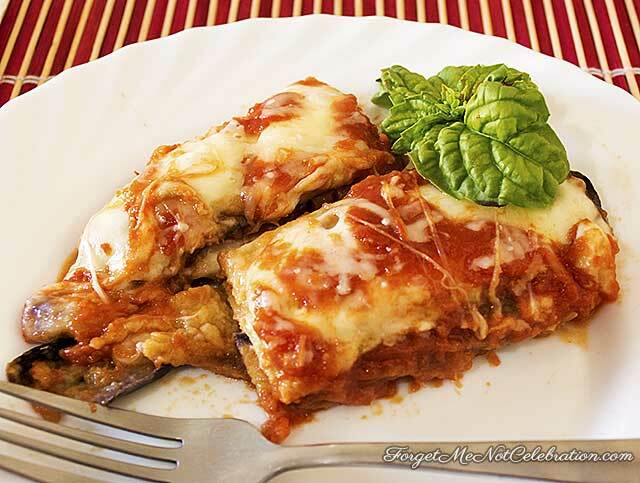 Place the browned eggplant on paper towels in order to absorb any excess oil. Thinly slice the mozzarella cheese and grate the parmigiano reggiano cheese. In a medium sized baking dish, cover the bottom with a small amount of the tomato sauce. Place a layer of the eggplant on top of the sauce. 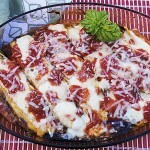 Top the eggplant with a small amount of mozzarella and then a small amount of tomato sauce. 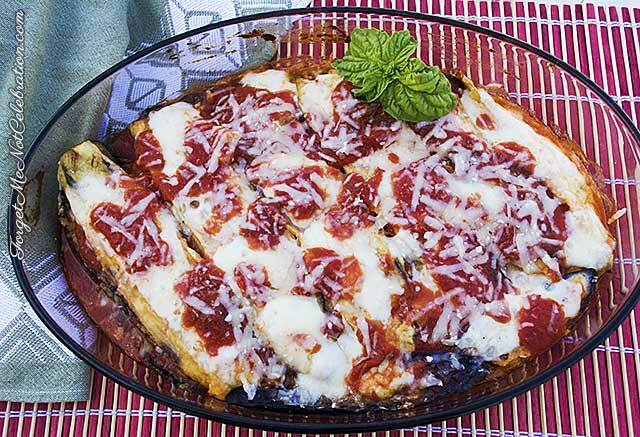 The key to this recipe is not to put too much cheese and tomato sauce on the eggplant. The taste of the eggplant should be predominant. Continue with two more layers. Top the final layer with the parmigiano cheese. Cover the baking dish with foil and bake in a preheated 350 degree F. oven for 20 to 30 minutes until bubbling. Remove the foil for the last 5 minutes to lightly brown the cheese. Peel the eggplants. Break the eggs into a bowl and lightly whip them with a whisk. Place the flour onto a piece of parchment paper. Slice the eggplant lengthwise into 1/8" slices. Dip each slice into the beaten egg and then into the flour. Lightly brown the slices in a frying pan using extra virgin olive oil. Place the browned eggplant on paper towels in order to absorb any excess oil.